You will need the account and routing number of the bank from which you are transferring the funds along with a driver's license and social security number for each accountholder. Note: There is a $225,000 maximum initial opening deposit for all online accounts. If you have any questions during the application process, please call our customer service department Monday through Friday 8:00am to 4:00pm at (833) 301-NFBK. Thank you for choosing Northfield Bank. (1) Annual Percentage Yield (APY) in effect as of 04/12/19 and subject to change without notice. Minimum balance of $2,500 to open account. All account balances above $0.01 will earn the stated APY's. There is a substantial penalty for early CD withdrawals. Fees could reduce earnings. (2) Annual Percentage Yield (APY) in effect as of 03/28/19 and subject to change without notice. A minimum balance of $0.01 is required to open account. The account will be charged a minimum balance fee of $8.00 each statement cycle if the average daily balance for that cycle falls below $2,500. Fees can reduce earnings. 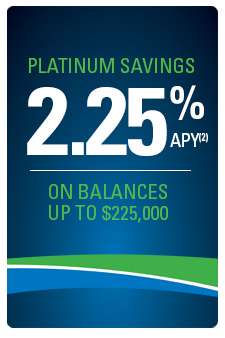 Account balances between $0.01 and $224,999.99 earn 2.25% APY on the entire balance. Account balances $225,000 and over earn 0.90% APY on the entire balance. Transaction limitations apply, see an account representative for details. New money is required to open a Platinum Savings. New money is defined as funds not currently on deposit at Northfield Bank. 581 Main Street, Suite 810, Woodbridge, NJ 07095 | (833) 301-NFBK. To report a lost or stolen debit card, please call (800) 554-8969.